… the day we went to Byron. 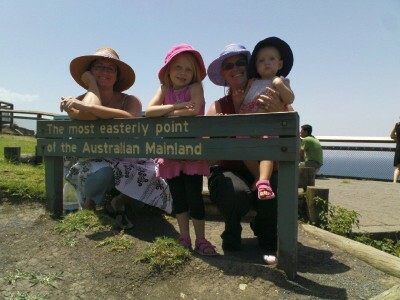 This is us at the Eastern most tip of Australia having just seen dolphins (two pods) down below. Excellent day. Schoolies provided the soundtrack while the kids were in the park and we got to get our “mummy bodies” out among all the waif thin girls. Photo compliments of Dylan. Best sight: a 60 years old woman with two twenty year old blokes lounging with her. WAsn’t quite sure what all of that was about – but she looked like a queen and was loving every moment. I’m aspiring to this when I am 60! It was the quarterly kindy working bee this morning and our turn to show up. November is not the best time to show up for a working bee. When I set off from home just before 8:00am it was already 30 degrees and very humid. 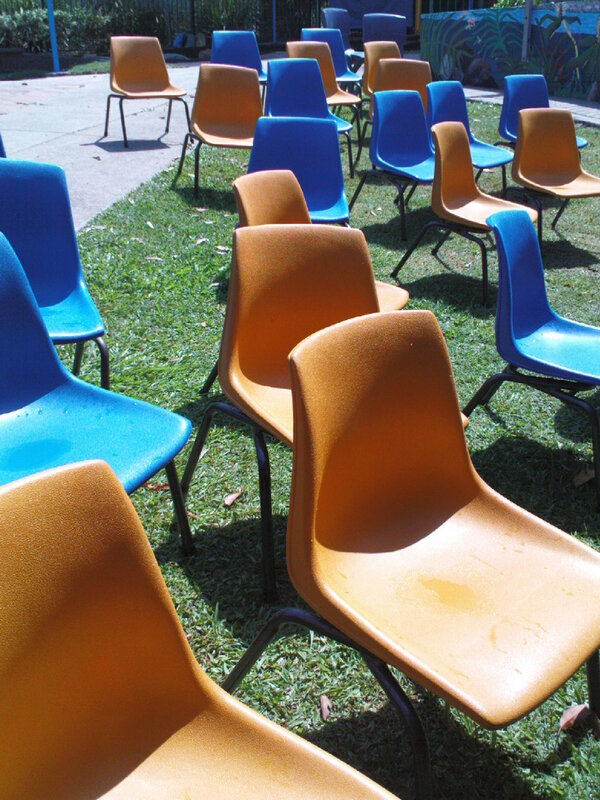 My first job was washing chairs with one of the other Mums. I’m sure this will figure in a story at some time in the future. I have officially won!! I crossed the word with 57, 178 words. There are 4,000 other words I didn’t include so unofficially 61,00o-ish words, but it doesn’t really matter too much once you’ve got the 50,000. Granted this is technically not a photograph – but I’m unable to take screen shot on my computer. For some reason it wont work so I wasn’t able to capture the moment were I got the “Big Win” up on the screen. So instead the official picture from the NaNosite. Later on in the week I will give the breakdown of my word count. 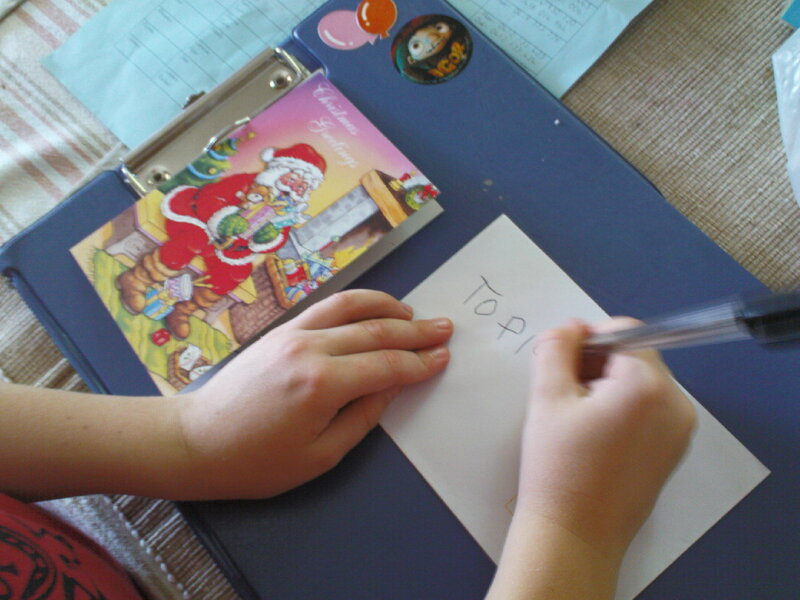 This afternoon Mr D insisted he sit down and begin writing his Christmas cards for kindy. Last year this was a long and awful process as he sat and wrote them all himself. This year he’s doing it himself again – but what a difference a year makes. I gave him the list and he copied down the names, wrote the envelopes, put on a sticker and then passed to me to put the card in the envelope. Oh and then marked off the name on the list with a purple crayon cross. Far less painful – but having said that I think we’re not quite half way through yet. When I disappeared to do the next rewrite on Fifteen Floors Above Bondi – he came in with a card written especially for me. This is such a wonderful age. My contract came through for Chinese Whisperings this morning. 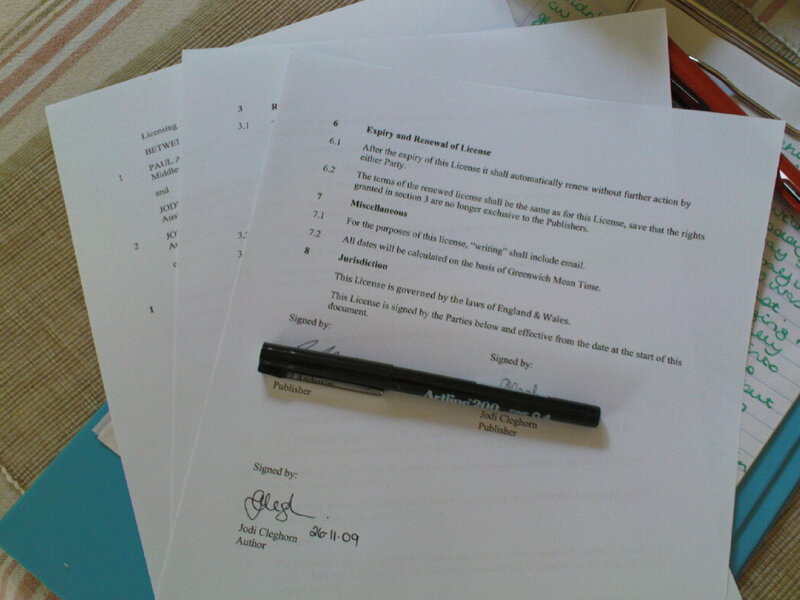 As dumb as it sounds, considering I proof read the contract and am both editor and publisher, there was a real buzz seeing my name and the title of my story on the document, and committing my signature to the bottom. This is all VERY real now. It would seem it is all about Mr D this week. 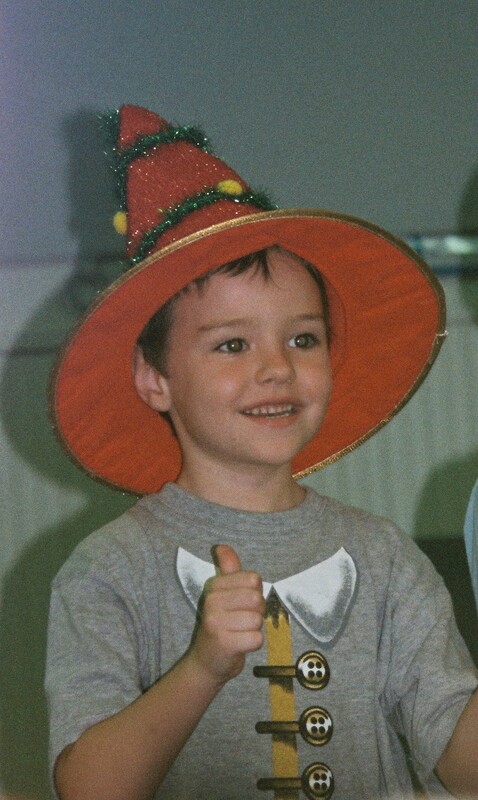 Today was the kindy concert. Last year I spent half an hour choked up, secretly brushing away tears at my little boy up there singing. I was much more composed this year. As always, they rock out. Dylan’s favourite song was about biting the heads off worms and sucking their blood out! Why do I keep having visions of him writing and directing “Texas Chainsaw Massacre – The Musical”. Today we had morning tea on the back deck with an old friend Kerry. Kerry is one of the founders of HMA and I met her first when I went along to a brainstorming session at her place back in 2004. From there I became a member of HMA’s submission writing committee for the Maternity Services Review. Much of what I apply to my business dealings and organisation came from the time spent over those three months with Kerry. She was keen to hear what I was up to with my writing. It was good to share with someone so keen to hear. She’s been following my Fourth Fiction novella in progress. 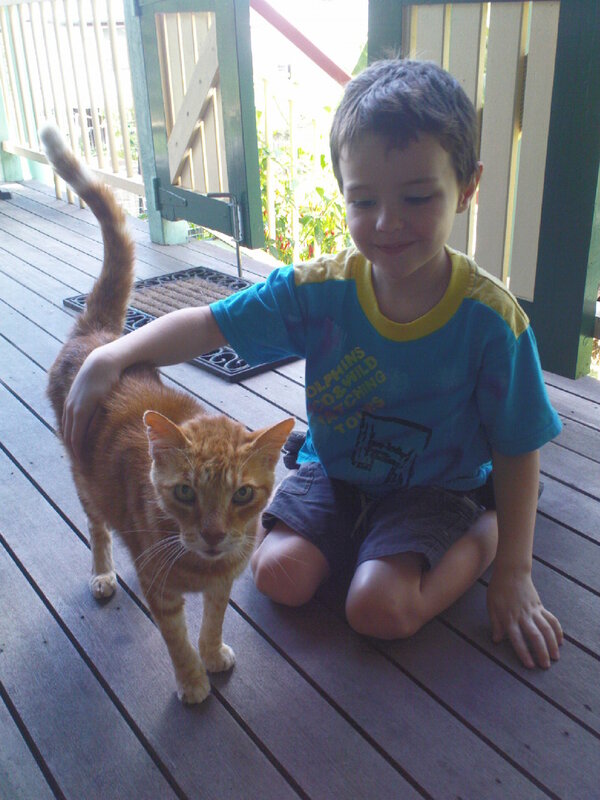 Dylan made friends with her cat Ginger Megs and insisted I take a photo of them together. Now I remember why I like you so much. It’s your intelligence and willingness to shake life and see what falls out of the tree. I’m going to put it up near my desk for the down days when I wonder why I bother and what drove me to it.